22 September 2010, at 10:39a.m. NETHERLANDS - Together with Sonac, Schothorst Feed Research has published together with Sonac a literature review about the feeding value and use of different fats and oils for pig and poultry feeds. 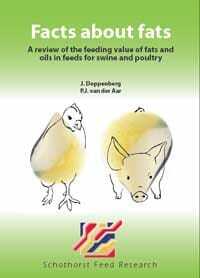 The book is entitled Facts about fats: a review of the feeding value of fats and oils in feeds for swine and poultry. The differences between the fatty acid patterns of the different fats are covered as well as the effect on body fat composition. A method is developed to calculate the feeding value based on lab analyses (Total Fatty Acids)and the digestibility of the fat source. For the latter the digestibility is calculated from the u/s (unsaturated/saturated fatty acids) ratio and the amount of Free Fatty acids in the fat source or finished feed. Fats and oils are more than 'just' energy sources for animal feeds, according to the book's authors, J. Doppenberg and P.J. van der Aar. The fatty acids as part of triglycerides or in fatty acid products differ in chemical composition and physical characteristics. The omega-3 and specifically the LC-PUFA omega-3 fatty acids can be considered as functional nutrients. Via the feeding of different fats and differing fat additions body composition and animal products can be modified. The main use of fats and oils in the feed industry is, however, increasing the energy content of the feed economically. Therefore knowledge about the digestibility of the fat for each animal category, the metabolisible energy content and the efficiency with which this energy can be used for different production goals are of paramount importance for evaluating the fat source of choice. This book summarises current knowledge from the scientific literature and concluded with a model to estimate the energy content in practice.